At the height of his power, Asian warlord Khun Sa, who died this week, commanded an army of thousands and supplied as much as a quarter of the world's heroin. As the drugs flowed from his fiefdom on the Thai-Burma border during the 1980s, he would play host to journalists and Western tourists, treating them to Taiwanese pop music and boasting of being a "king without a crown". A seasoned guerrilla fighter, he once had surface-to-air missiles at his disposal and fended off sorties from national armies. Even with his back to the wall in the mid-1990s, with Burmese troops advancing and his forces riven by political infighting, he managed to cut an extraordinary deal with his sworn enemy - the Burmese government. In exchange for his surrender, he was protected from extradition to the US and reportedly given a concession to operate a ruby mine and a transport company - allowing him to live out the rest of his life in luxury in Burma's main city, Rangoon. It was a staggering feat of self-preservation from a man whom US officials had nicknamed the "prince of death" and offered $2m (£1m) for his capture. Born in 1933 to a Chinese father and a mother from Burma's Shan ethnic group, Khun Sa's given name was Chan Chi-fu. Growing up in the Burmese countryside, he had little education and came of age fighting Chinese nationalist Kuomintang (KMT) soldiers, who had been forced out of China by the Communists. The KMT rapidly took over and expanded the opium trade in the region, but Chan Chi-fu and his gang gradually began to exert their influence during the 1960s. Allied with the Burmese government, they are thought to have fought against both the KMT and the Shan nationalists in exchange for being allowed to continue trading opium. The term Golden Triangle was coined during this period to describe the drug-producing region on the border of Thailand, Burma and Laos. But Chan soon fell foul of the volatile alliances drug crime engenders. He had annoyed the government by cosying up to the Shan nationalists, and was thrown into jail in 1969. 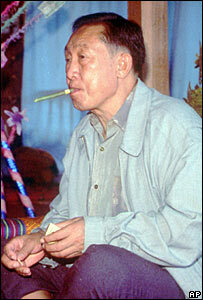 On his release five years later, he took the Shan name Khun Sa and allied himself to the cause of Shan separatism. An already devoted band of fighters was consolidated on the Thai border and eventually became the Mok Tai Army - a fighting force of more than 20,000 troops. By the 1980s officials estimated that Khun Sa controlled more than half of the opium going through the Golden Triangle - which in turn was said to account for half the world's heroin. He once told the Associated Press: "My people grow opium. And they are not doing it for fun. They do it because they need to buy rice to eat and clothes to wear." But the US Drug Enforcement Agency did not agree. In 1994, agency spokesman Thomas Constantine was quoted by Reuters as saying: "He has delivered as much evil to this world as any mafia don has done in our history,"
And like many mafia dons, Khun Sa's delicate political balancing act eventually began to unravel. A renewed offensive waged by the Burmese government during 1994, combined with fierce fighting against the rival Wa hill tribe, was beginning to take its toll on the Shan separatist movement. With the situation increasingly desperate, Khun Sa made his boldest play. He convened a Shan "parliament", attended by hundreds of delegates, and later announced the formation of an independent Shan State - of which he declared himself president. But control of his own forces had begun to slip, and a faction calling itself the Shan State National Army broke away from the Mok Tai Army in 1995, accusing Khun Sa of using Shan separatism as a front for drug running. Facing increasingly determined foes, and with his movement falling apart, Khun Sa did what to many must have seemed unthinkable - he surrendered to the government. However, he did so on his own terms, ensuring his last decade would be one of peaceful opulence in Rangoon. During his last years he was awarded the status of an honoured elder by the regime he had fought against for so long, and many Mok Tai Army soldiers became members of the militias that help maintain the repressive junta. According to his family, Khun Sa died at the age of 74 at his home in Rangoon. Khuensai Jaiyen, a former guerrilla who fought alongside him for more than a decade, said few Shan separatists would mourn him. In fact, the ashes of the former warlord would not even be returned to his Shan homeland for burial, he said. "He thought his tomb might be destroyed."